Mon, Apr 22, 2019, 22:16:33 ---- The fact: 42.844.000 visitors done. 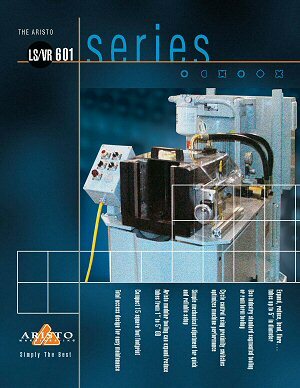 Aristo: New literature on LS/VR 601 Series tube end former Aristo Machines, Inc.
Indianapolis, IN -- New full-color information sheets that describe Aristo Machines, Inc.s LS/VR 601 series tube end forming machine are now available. The LS/VR 601 is a compact hydraulic machine designed for a wide range of tube end forms. Utilizing either industry standard "drop-in" style segmented tooling or ram form tooling, it creates an array of end forms on tubes up to 5" in diameter. The power system on the LS/VR 601 includes a Parker V-Pak with a 15 HP motor and Parker D3W series hydraulic directional control valves. These control a 6" x 6" cylinder for effectively driving the segmented tooling or the ram tooling, and a 4" x 4" cylinder for reliable clamping. The control system is based on Allen Bradley Micrologix technology. A foot switch starts the cycle and easy-to-use proximity switches are used to control the cycles, thereby optimizing utilization of machine and operator. The LS/VR 601s compact 15 square-foot design allows for efficient use of floor space and accessible components. The use of standard components minimizes inventory and downtime. The machine is designed for easy maintenance access to maintain the system in peak operating condition.